The Simrad ES120-7CD is a split-beam composite transducer with a large bandwidth. This large bandwidth provides a fine range resolution, which is important for single fish detection and target strength measurement. The transducer has four sectors. The ES120-7CD has been designed to withstand a large water pressure. It is therefore well suited for underwater vehicles and other submerged platforms. The cable on ES120-7CD is two meters long. It is fitted with a 8-pin MacArtney SubConn subsea connector (MCIL8M). The plug fits directly into WBT Mini, WBAT and EK80 Portable. 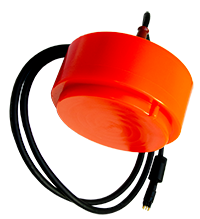 The transducer is designed for mounting through the hull or a mounting frame using a mounting ring and a clamping ring. Download the Simrad ES120-7CD data sheet.